PRESS: Yes! You can use any of our videos/photos. Lisa Gautier of Matter of Trust, holding up hair boom originally planned for rolling on tar balls but was tested in the black waves that came in as she was standing there. The boom is soaked in oily slime. As oil came in fast we weren’t properly protected. This beach was open to the public and there were kids and swimmers all caught by surprise by how much oil came in within a few minutes. 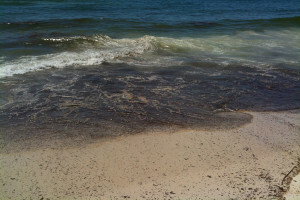 We want to stress that if oil comes in, leave the beach. And if you are cleaning the beach, wear protective clothing. Lisa immediately washed off. Oil and dispersants are irritants to the skin, at best. 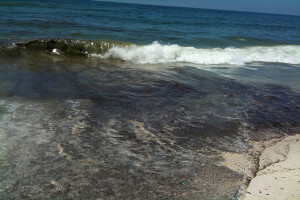 In the BP Oil spill black waves come in fast when the oil plumes arrive on Orange Beach white sands. 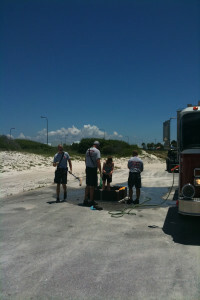 Decontamination area was set up quickly by the Orange Beach fire department for people running off of the beach. Lisa gets scrubbed down here. 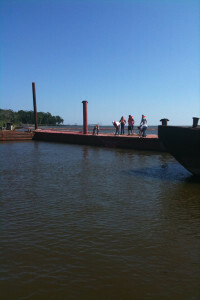 Weeks Bay Barges – Jamie Hinton Fire Chief & Mayor Charles Houser make a stand and put out barges to prevent oil from getting into their estuary. But they know the oil will sink even below their barges and so now they’re using our natural fiber booms attached to ropes and anchors in a grid that lets in fish and currents but designed to catch as much oil as possible. Sixteen thousand hair salons and pet groomers from all over the U.S., Canada, and 30 other countries have donated hair and fur to Matter of Trust to help make hair booms for oil spills. 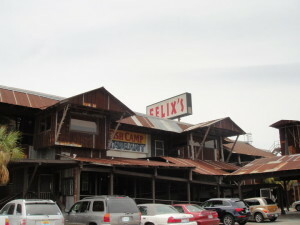 Felix’s Restaurant in Alabama where a Boom-b-que was hosted to collect hair and fleece to make booms. Hairs made at Felix’s Boom-b-que. 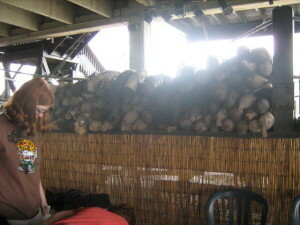 Booms made during Boom-b-que at Felix’s Restaurant, Alabama. BP oil spill with hair booms soaking up oil. 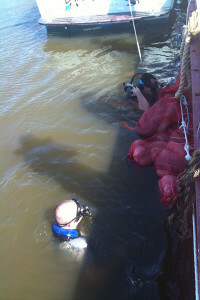 Volunteers from the National Guard in Louisiana helping to load hair booms for transport to oil spill. 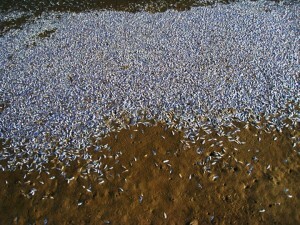 BP oil spill – thousands of dead fish. Hair booms and in storage. 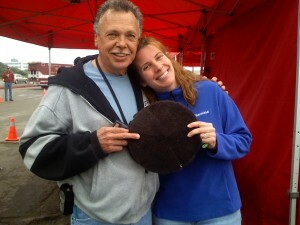 Phil McCrory, of OTTI MAT Inventor of the hair boom and the hair mat with Lisa Gautier of Matter of Trust Thanks Phil for generously letting our charity research with donated US fibers for 10 years and now to make booms for donation in the Gulf. OTTI MAT owns the hair mat patent and makes mats for industrial use and quantities by purchasing hair in China and making mats there according to EPA specifications. We hope BP will buy Phil’s mats and support his invention, the way Phil is in support this grass roots donation effort to protect the Gulf! 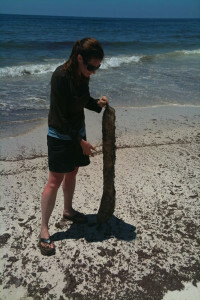 June 14, 2010 Orange Beach Florida – Oil soaked up by donated booms made of hair, fur, fleece & feathers stuffed into nylons and put in shrimp bags with pool noodles. 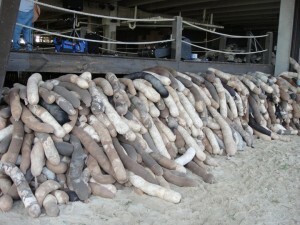 Alabama – Fiber booms Hair / fur / fleece in mesh bags that hold 2 boom each and zip tied to line w/ buoys. 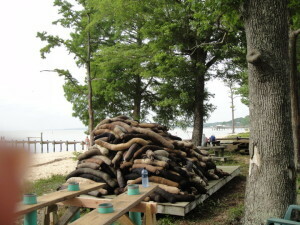 ALABAMA – The bags of boom are zip tied together and strung pier to pier. To make sure flotation isn’t an issue donated pool noodles are cut up and added on top of the shrimp bags holding the boom. The nylons hold the tiny fibers and both the nylons and shrimp bags let oil and water in and out. Holding fleece boom in the water the oil sticks to the mesh and the fleece pulls it in. Huge thanks to Sam and Amanda! 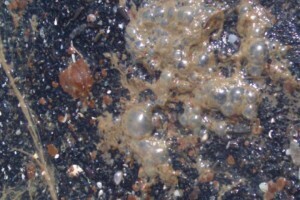 FLORIDA – Booms rolled on beaches slurp up gooey tar balls. Raking is hard on Turtle eggs, rolling booms and using hair mats is gentler on the beaches. Alabama – 6/10/10 it’s like Earth is bleeding. The red oil is everywhere. Rocks are VERY hard to clean and we’re using burlap bags stuffed with boom to protect rocks now. 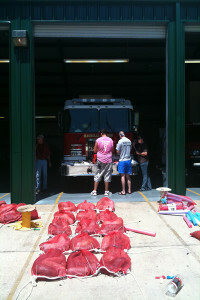 Florida – Air Force volunteers helping make booms – HUGE THANKS! 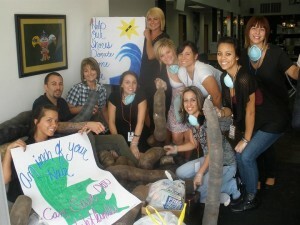 Harbors prepare by stocking up on donated hair, fur, fleece, feather boom. 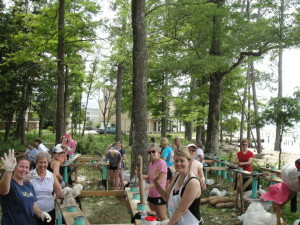 Miles of boom made at Felix’ Fish Camp, Mobile Alabama, volunteers led by Amanda Bacon. A boom mountain in Ft. Walton FL and this is one of 19 mountains and we still have 9/10ths of the donated fiber to boom. Everyone is SO generous with volunteer hours and in sending in fiber, packaging and funding to help this program! 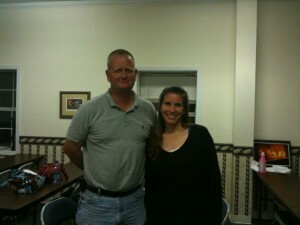 Lisa Gautier and Yente Sehman – Volunteer and Warehouse coordinator Ft. Walton (with Barbara Johnson, not shown). Lisa Gautier, Matter of Trust at Mobile Baykeepers event. Robert Kennedy wants to hear more about the thousands of you who are helping the Gulf States through donations of fibers for booms. Amanda Bacon – SOS Save Our Shores, Yente Sehmen, Philippe Cousteau, Lisa Gautier at Mobile Baykeepers event for the Gulf Coast. huge thanks to Summer, Chris & Craig for photography! Matter of Trust is operating in the Deep Water Horizon Oil Spill with permission from World Response Group, Inc. the owner of the patent for OTTI MAT. Matter of Trust’s booms are for donation to the Gulf. 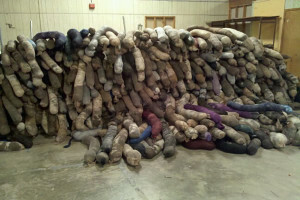 They are made from donated fibers and assembled by volunteers. They do not meet the specifications of the industrial made OTTI MAT. OTTI MAT purchases hair in China and manufactures mats in China and OTTIMATS are approved by the EPA and NASA & Page 2..
Florida – artists and musicians come to turn boom making into a party! Thanks Phil for generously letting our charity research with donated US fibers for 10 years and now to make booms for donation in the Gulf. OTTI MAT owns the hair mat patent and makes mats for industrial use and quantities by purchasing hair in China and making mats there according to EPA specifications. We hope BP will buy Phil’s mats and support his invention, the way Phil is in support this grass roots donation effort to protect the Gulf! Baby Boom B Qers. It’s that easy!